Zebra mussel populations continue to expand in the Iowa Great Lakes. The populations is expected to continue to increase in the coming years before reaching a limit and moderating. The biggest impact to lakeshore residents continues to be colonization on hoists, docks and swim ladders. Tips: Colonization of mussels on galvanized metal is minimal. Zinc and copper coatings work well to keep mussels from attaching. Store swim ladders above water periodically can minimize colonization. Young zebra mussels can’t survive out of water for more than a day or two. Intakes of irrigation systems can clog with zebra mussels. Replacing the intake screens with a copper or galvanized screen can help reduce clogging. The electric fish barrier has been working effectively. The wet period we’ve experienced over the past year means the barrier has been operational for its longest period since installation. The fish barrier was designed to be effective against Asian carp, but as the threat of more aquatic invasive species emerges, the barrier’s purpose may expand. When you think of the Iowa Great Lakes you are bound to think of our water clarity and shoreline. These are things that we both see and experience when on the lakes, yet it’s important to understand that the water that fills our lakes comes from its watershed, the land and other bodies of water draining into the lake. Over the past few years conservation partners have been targeting sloughs, wetlands and smaller lakes, including Center Lake which is a 257 acre body of water. The past few decades Center Lake’s water quality and habitat have been deteriorating due to excessive runoff from a large urban/residential area in the NE portion of its watershed, lack of sanitary sewer along the southern shoreline, an overabundance of common carp and severe erosion along the northern shoreline. What has been done at Center Lake? – Low impact development practices implemented in 2013 by the City of Spirit Lake & local businesses worked in concert to install several low impact development practices to intercept rainwater runoff from parking lots and rooftops. These structures can be seen at Lakes Regional Healthcare, Super 8 and the Eyecare Centre to name a few. – The Iowa Great Lakes Sanitary District has explored cost and logistics of bringing service to the south side of Center Lake where homes currently rely on septic tanks. By removing the tanks and their drain fields, the sanitary lines could remove a significant source of nutrients fueling algal blooms. – Small rock barriers have been placed at key locations to prevent carp from entering connected marshes where they spawn. The DNY is working to adjust stocking rates and species for Center Lake. Mild falls and winters have provided the opportune environment for this invasive species, introduced to our lakes in the middle of last century, to outcompete many of our beneficial native aquatic species. Due to its unusual growth cycle, the Curlyleaf pondweed can create dense mats on the lake surface up to 12 feet in depth. 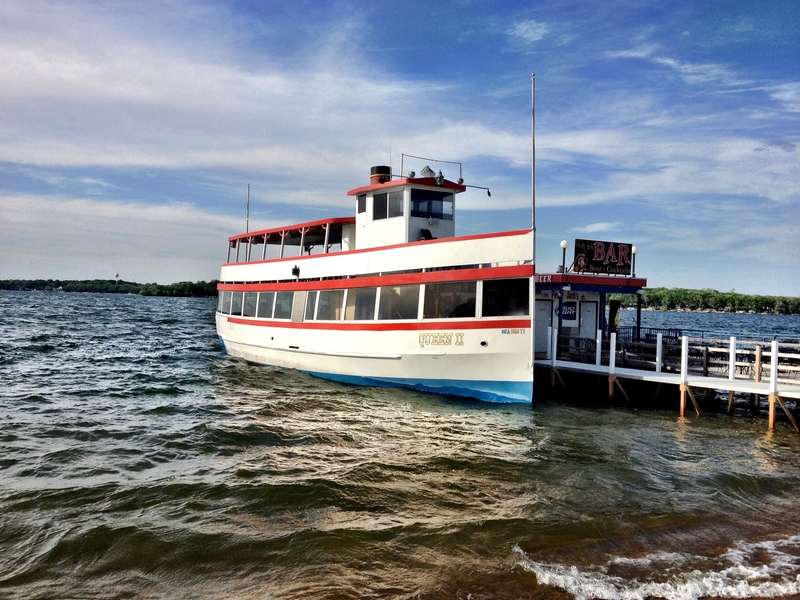 While the weed is found throughout our chain of lakes, it has created some access and navigation problems on the north half of East Lake Okoboji through late June the past few years. This year, the DNR has been working with the East Okoboji Lakes Improvement Corporation to develop a management plan to improve lake access in the most affected areas. This remains a daunting challenge due to resistance to the use of herbicides. Mechanical removal is the only alternative, yet with over 600 acres of affected lake, it is not feasible to address the entire problem with mechanical removal alone. Kuhlman Lake Service is selling the Hydro-Sweep Pro that helps keep waterfronts and dock areas clear from algae, Curlyleaf pondweek and decaying surface debris by mimicking natural water movement. Underwater Solutions can physically remove the Curlyleaf pond weed around docks and hoists. This blight, which weakens the majestic oaks surrounding our lakes, allows secondary invaders the ability to kill the trees providing much of the aesthetics around the Iowa Great Lakes. The Iowa Great Lakes Association has been in constant contact with 4 area service providers/arborists and the trees can be saved with a treatment protocol. Visit www.iagreatlakes.org to learn more and receive up-to-date information as spring is the time to begin treatment to save our trees.